An eagle-eyed Reddit user posted this picture earlier this week. 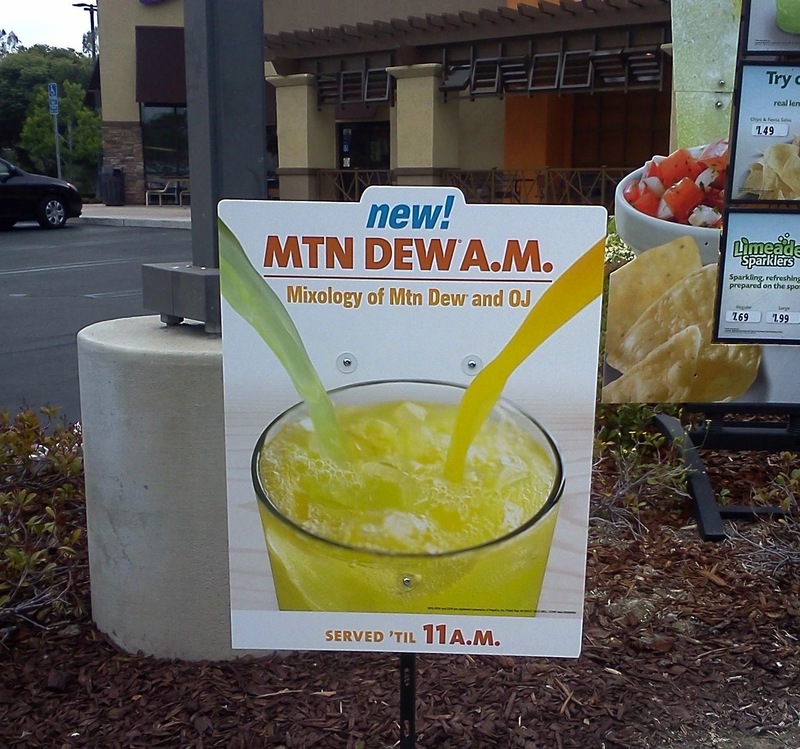 It shows Mountain Dew A.M., a new beverage choice consisting of half Mountain Dew and half orange juice. Thankfully, it’s only served until 11 a.m. Coming soon to a Taco Bell by you! Cause otherwise that would be disgusting. I wish this was a joke, but a company spokesman confirmed the rollout in Southern California to Fox News. “”Our customers love Mountain Dew and it’s one of our most popular beverages, so we are testing Mtn Dew AM in Fresno and Southern California as the latest innovation to our FirstMeal Menu. We’re pleased with the initial reaction from our customers, and if it does well, we’ll roll it out to all our restaurants that serve breakfast,” Rob Poetsch, Taco Bell spokesman, said in an email. More than 32 percent of Americans could be obese by 2030, with 11 percent severely obese (more than 100 pounds over a healthy weight). Thankfully, we still have the freedom to drink what we want.